Beebe Medical Foundation’s 23rd Annual Best of the Beach Art Auction, Dinner & Dance will take place on Saturday, June 9, beginning at 6 p.m. under a tent on the grounds of Beebe Medical Center’s Beebe Health Campus, located on Route 24 in Rehoboth Beach. The annual Best of the Beach fundraiser galvanizes community support for both Beebe Medical Center and the Rehoboth Art League. This important fundraising event becomes more exciting each year, and well deserves its top billing as the most enjoyable evening of the summer season. This year, Big Fish Grill will cater and the ever popular Love Seed Mama Jump will keep partygoers on the dance floor. 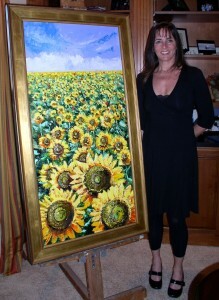 Local painter Kim Klabe will be the featured artist in the live auction with her colorful oil painting that depicts an abundant field of sunflowers in front of a voluminous sky. Kim is a Rehoboth Beach oil painter who focuses on familiar local sights: quaint cottages, aging farmhouses, and beach homes that capture the essence of historic Sussex County. There also will be the traditional silent auction featuring art and gift items. • Educating staff on the latest skills and therapies in Women’s Health Nursing. Most of this individual’s time will be spent on the patient care unit providing “just-in-time” education and looking at current processes and procedures, ensuring they are structured to provide the highest quality outcomes. There is also time dedicated to teaching patients, parents and families about the care of their newborn and to ensure a safe transition from hospital to the home environment. This individual will work closely with the nurse manager of the Women’s Health Pavilion and the Director of Nursing. “Hiring a clinical nurse educator will greatly benefit this service line, as well as Beebe Medical Center. It also demonstrates a key resource to ensure we provide the highest level of quality care to our patients,” says Director of Nursing Mike Knapp, RN, MSN, NEA-BC. The standards of practice are constantly changing in the field of medicine and this position exemplifies Beebe Medical Center’s commitment to the continual improvement of patient care. “More and more young families and children are moving to our area every year and the need to update and improve Women's Health Services is essential,” said Lisa McLamb, who is serving as this year’s Honorary Chair of Art Auction with her husband Buck. The McLambs started the Dakota McLamb Fund at Beebe Medical Center after the unexpected loss of their newborn son, Dakota, in November 2010. The Fund was created to benefit Beebe’s Labor and Delivery Unit, particularly during emergency circumstances. It has purchased two new pieces of equipment. For ticket or sponsorship information, please call Beebe Medical Foundation at (302) 644-2900. Beebe Medical Foundation was established in 1989 with the sole mission to raise philanthropic support for Beebe Medical Center. The Foundation is located at 902 Savannah Road, Lewes, DE 19958. Visit us online at www.beebemedicalfoundation.org. Photo caption: This year’s featured artist, Kim Klabe, with Field of Dreams.